You'd like to camp for free? In an RV or trailer? RV Love has a great article with 29 Tips for Successful Boondocking. Boondocking is camping off the grid - no electricity, water, sewer. THIS is how we used to camp in the 1980's and 1990's. It's currently a bit more challenging to boondock - but there are still lots of spots where one can go to "unplug." Most often these are BLM (Bureau of Land Management) sites, USFS (US Forest Service) / USDA sites or a variety of other federal and state lands. RV-camping.org provides a lot of info on boondocking. Free Campsites.net hosts a map with a variety of free camping listed. Simply googling "free camping" or "camping" on BLM and USFS sites will find spots. We found some great sites on USFS lands around Crescent City, CA. We have spent nights in rest areas, truck stops and retail parking lots while traveling from one state to another. We've heard many churches and some clubs (like Rotary, BPW etc) will let you stay if you are members. Call ahead. We call this Urban-Docking and we stay for ONE NIGHT in these locations. 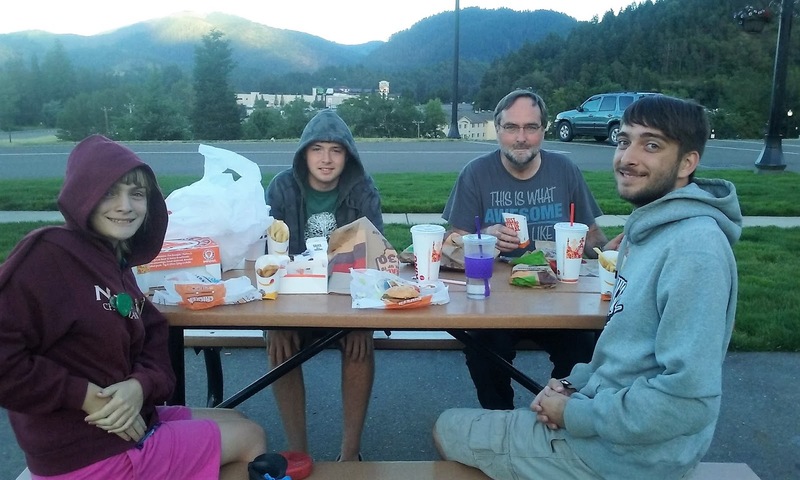 Our favorite Urban-docking site is Jordan Creek Rest Area, outside of Canyonville, OR. We like the aps RV Parky and Allstays for finding these spots. In these areas you are usually dry camping - still off the grid. We always confirm with managers before staying in retail spots. We obey any signs we see instructing no over-night parking. A note - if you do this - please be considerate, clean up after yourself, buy your groceries where you park, don't lower hydraulic jacks on hot asphalt etc. We have noted truck stops to be NOISEY. Our original thought was to shower at a truck stop/stay free, while purchasing propane and diesel.....we quickly discovered showers are expensive these days. It is cheaper for our family of 5 to stay in a RV park with a full hookup, than to pay the price of showers for 5 at most trucks stops where we've stayed. In Idaho they wanted $65 for our family to shower - we passed. We don't like to drive with lots of water weight on board to take our own showers...and so we tend to alternate urban-docking with a campground as we travel. Mooch-docking is when one stays in someone's driveway - always invited, of course! 😉 If electricity or water is provided, I would assume one is no longer "boondocking".....A level spot one can get into, possibly water and electricity - and you're good to go. Friends and family often offer showers and laundry services. If you've followed our travels you know we mooch-dock whenever possible - not because it is free (and we always try to leave $ for electricity and water), BUT it allows us to visit easily with friends and family. We've stayed in Krista's driveway, John and Nadine's driveway, Joe's RV spot, Dennis & Susie's driveway, Will & Sherri's driveway, and we're spending this week mooch-docking at Earl and Mary's (Michael's brother and wife). There is a great network of RVers across America and Canada who offer sites for free at their homes - Boondockers Welcome. This is a site we plan to use as the need and opportunity arises. I've noted some spots up the AlCan Hwy that look promising. We are considering becoming hosts when we settle in a location. Tents for Troops is not "docking" of any sort. However, if you are ACTIVE DUTY, member campgrounds will allow you to stay free for two nights - full hook ups. We've done this at a few locations whilst active duty and all of our stays were enjoyable. The two that stand out in my memory are Toutle River RV Resort near Mt. 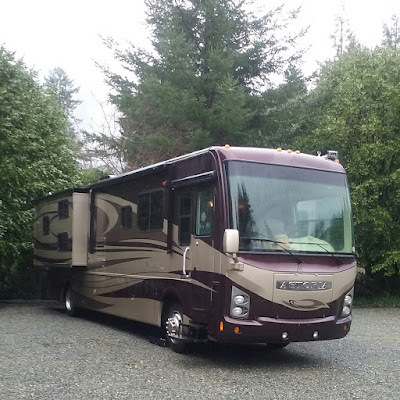 Saint Helens, and Lone Mountain RV Resort in Obrien OR on the way to the Redwoods and more.